Are you looking for the best Encino tattoo shop/parlor or the best tattoo artists in LA? We have a few. Check out Studio City Tattoo in Studio City Los Angeles right next to Encino California. Studio City Tattoo has been voted best tattoo shop in LA many times over the years. 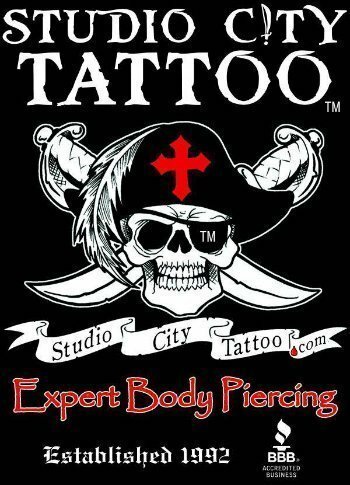 Inside Studio City Tattoo is Los Angeles Body Piercing LA’s premier body piercing shop and offers the highest quality 18kt gold body jewelry by Anatometal and BVLA Body Vision Los Angeles. When looking for the best Encino tattoo shop please consider that Studio City Tattoo is a short ride from Encino. With over 600 reviews and a 5 star rating on Yelp, we think you will be happy you made the choice to visit us. Studio City Tattoo has been in business since 1992 and is celebrating its 25 anniversary. We strive to bring our best to the body modification chair every time we perform a tattoo or body piercing. Call us for a free consultation appointment. Please bring us any artwork or ideas that you have with you when you come to see us. We have been blessed with the best customers in the world and would love to add you to our shop family. We look forrward to making new friends.